It's been a while since I did my recap of the Flea. For those that don't know me, I'm Juli, I'm the Flea's Event Photographer. You're probably pretty familiar with my work if you've checked out the flea Instagram on the day of the Flea. I run (for the most part) the photography that goes on, on the day of the Flea. Some say I have the best job at the Flea, I'd probably have to agree with that. So without further ado, let me give you a low down on my favorite finds at the flea this past month. First stop at any Flea is getting some breakfast and a coffee. I get to the Flea pretty early, and I need to fuel up before my walk around. This particular morning we went for the Cowboy Bagel. If you're like me and you are pretty skeptical of using a bagel as a bun because it's too hard. Think again. Burning river steams their bagels to perfect to make them soft and chewy. The Cowboy Bagel features a hamburger patty, cheddar cheese, bacon and deep fried onion rings. I've been trying to be a plant mom for years, but I'm starting to think I'm not cut out for this job. So I thought my best alternative is an air-plant, minimal watering, probably the only plant that truly thrives on my neglect. Probably one of my favorite additions to the Flea this month is the Flower Market. First off, Mackenzie, looking simply at home whipping up those bouquets for all of you. I myself brought home a bouquet for my momma. Bouquets start at $30 which is an absolute steal for the amount and quality of flowers provided in the bouquets. Flea shop is always a shop for me. This month they features two curated boxes featuring products from Fount, and Revival. You can also stop by Flea Club to join and get a cookie. And who doesn't love a Cookie? For Lunch we smashed on a burrito from Wholly Frijios. We got the tequila lime chicken, rice, beans, sour cream and corn salsa. We tried not to fall asleep after this burrito food baby. If you aren't a flea club member you are really missing out. 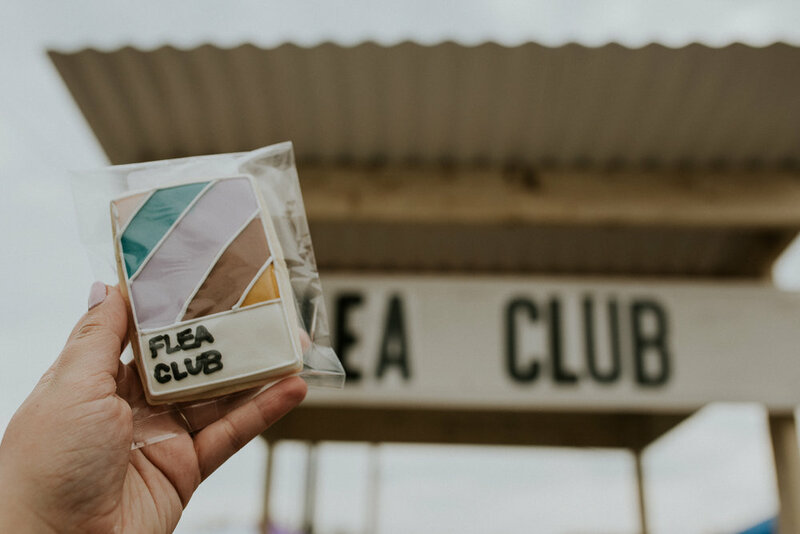 Did you know that the first 30+ people in the door get a free cookie when you check in at the flea club booth? And seriously the cookies are to die for. Want to get featured? If you see me at June Flea please feel free to stop me to snap your pic! We love to feature our Flea Friends.